...a Severe Thunderstorm Warning Remains In Effect Until Noon Cdt For East Central Kerr...southwestern Gillespie And Northwestern Kendall Counties... At 1121 Am Cdt, A Severe Thunderstorm Was Located Near Cypress Creek, Or 8 Miles East Of Kerrville, Moving Northeast At 45 Mph. Hazard...quarter Size Hail. ...Read More. Home News Local News Aww… Hail, No! GRAPELAND – Spring storms ripped through the Grapeland area on Saturday, April 6 leaving a trail of damaged roofs and vehicles in their wake. The back window of a Nissan Sentra is pictured after a hail storm ripped through the Grapeland area on Saturday afternoon. Photo by Will Johnson/ Messenger. It was a dreary, rainy afternoon one moment and then suddenly it was hailing. This was no ordinary hail, either. 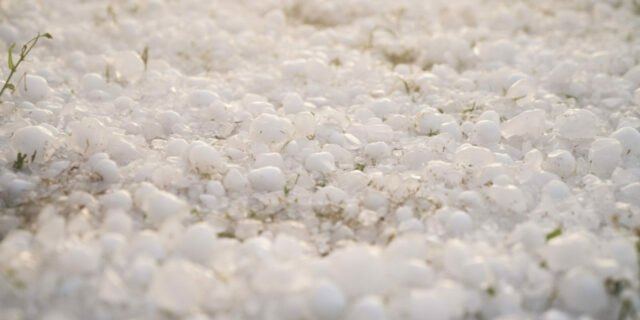 The frozen precipitation ranged from pea-sized hail in Crockett and Palestine, to golf ball or baseball-sized hail in Grapeland. There were even reports of grapefruit/softball-sized hail in the area. “I witnessed some baseball or softball sized hail,” Houston County Emergency Management Coordinator / Fire Marshal Roger Dickey said. “I’ve been here my entire life and it’s the biggest I can remember seeing. We contacted our insurance company e we had some damage at the fire station. That’s understandable because probably every roof in Grapeland …” Dickey said. He went on to say he had not heard of any reports of injuries but added a structure fire later on Saturday evening may be attributed to lightning associated with the storm. Dickey further indicated there did not appear to be tremendous amounts of wind damage. As far as damage estimates, Dickey said it was still too early to put a price tag on the damages. Unfortunately, two of the things which travel along with hail are “storm chasers” and unethical contractors. While area residents are encouraged to use local roofers first, the amount of storm damage may force homeowners to seek repair work from elsewhere. Be especially careful of door-to-door contractors. Don’t sign over insurance checks to contractors. Be wary regarding damages you can’t see.